When I was a kid, I enjoyed reading. There were certain book series I was especially interested in, and as an introvert, I spent a lot of time hiding away to read. As an adult, I still enjoy reading, but I’m much more particular with what I read. Magazines full of salacious celebrity gossip, parenting tips and home decor ideas tickle my fancy more than a popular book that all my friends are reading. Truthfully, as a busy mom, I just don’t have time to read that much these days. And when I do, I prefer to catch up on the latest entertainment news, rather than saturate my mind with daydreams and fantasy romance novels. But let’s talk about kids! If you have kids who love to read, that’s awesome! And I’m all about encouraging a strong love of reading. My kids love reading books before bed, and my little guy will often ask to sit down and have me read to him during the day. One way to keep kids interested in reading is by giving them a really cool place to do it. Something like a cozy reading nook, where they can curl up with a good book and get lost. 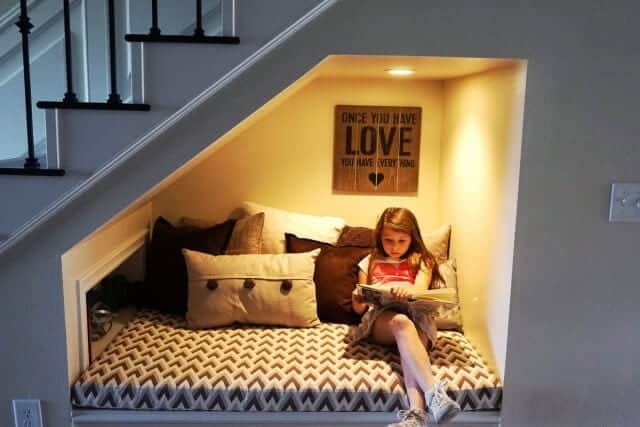 It doesn’t take much to create a cute little reading space, and these reading nooks are a great start for finding design inspiration. A reading nook doesn’t have to be a closed off area. I love the open design of this nook! With a couple book shelves installed, you can easily toss a fur rug and bean bag chair on the floor for a space that is comfortable and modern. 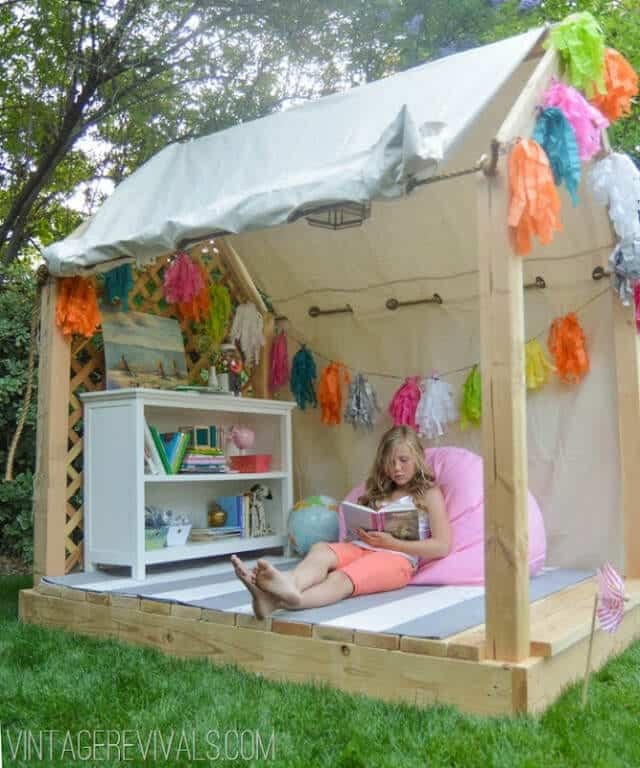 This is ideal for older kids who don’t mind sprawling out for a reading session. Head over to House of Hire to see the rest of this room. What’s great about this reading area is that it offers a nice open space, as well as a closed off corner. 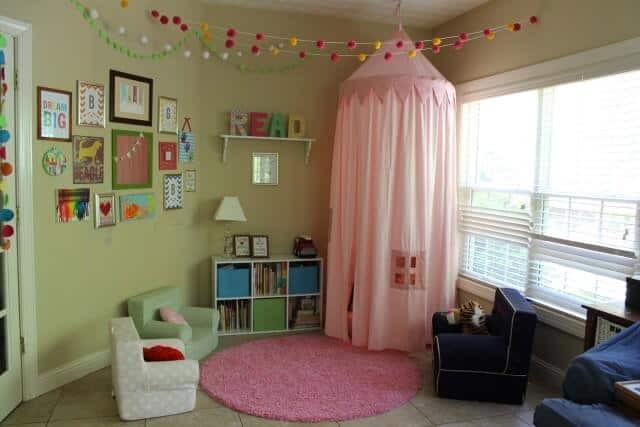 Depending on your child’s mood, she may enjoy reading in a comfy chair one day, and hiding behind the curtain the next. Anything that encourages children to be independent and imaginative gets a thumbs up in my book (no pun intended)! Also, the playful colors used here are so much fun! 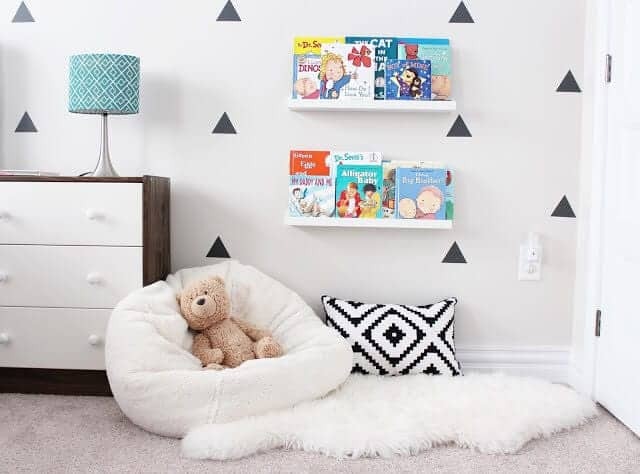 Check out more of this playroom reading nook over at Goat & Lulu. Before this space was a reading nook, it was being used as a linen closet. Talk about an awesome transformation! 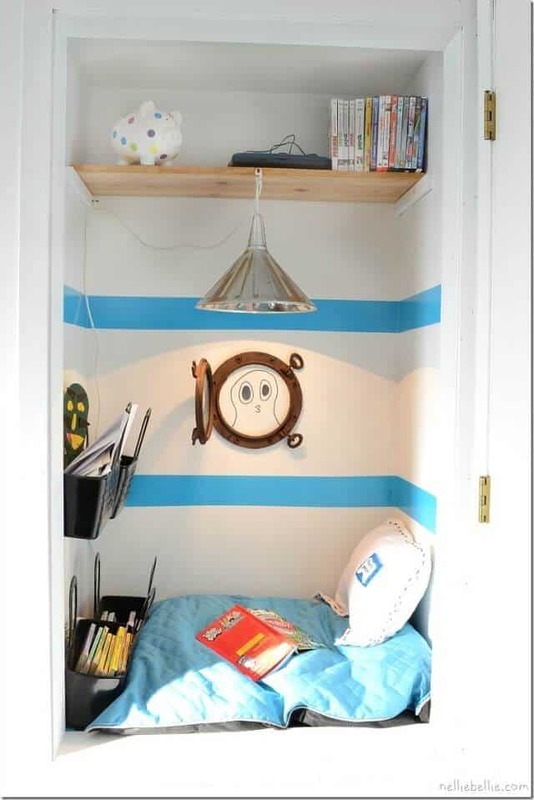 I’m too claustrophobic to read in a small space like this, but I’m sure kids would love it! The DIY elements give it personality, and it’s a great use of space. Stop by Nellie Bellie to see how this went from holding linens to holding little readers. When I think of the words “reading nook,” I think of somewhere really condensed. Somewhere like a closet. This adorable reading nook was converted from a closet, and it looks great! It’s simply designed, but it also has some personality with artwork and sweet colors. Check out the before and after over on LifeWithDaugs. Sometimes you have to work with what you’ve got. And sometimes, you ain’t got much. A resourceful way to utilize space under a staircase is by turning it into a reading nook. This is something I would love to have for guests. If they wanted to step away for some personal time, a nice little space like a reading nook makes a great getaway. 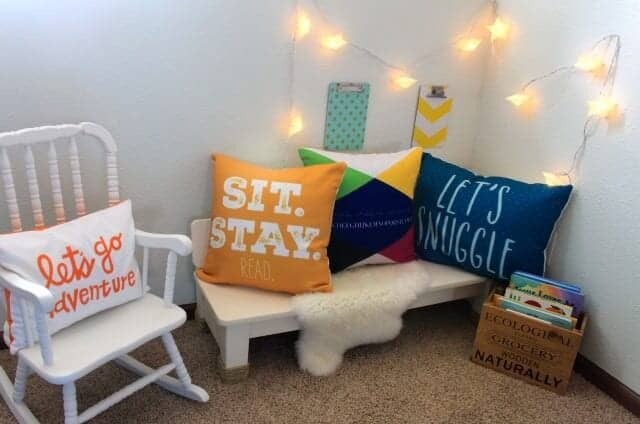 You’ll find more reading nook ideas over at Cushion Source. Bold colors, fun prints and a cozy rocking chair are the ingredients that make up a great reading nook. This was created for two brothers, and I love the boyish details! Those star hanging lights are a great addition, and that bench is the perfect height for little ones. Head over to Our Family Roost to see more details of this cute room. A reading nook…outside? How clever! On days when the weather is nice, this would be such a peaceful place to go. Bringing the indoors out is always a fun way to decorate, and this reading nook is probably my favorite. It’s quite easy to make, and the colorful details give it charm and style. Find out how it was constructed over at Vintage Revivals. I’m a wife, mother and everything else associated with domestic life. I can often be found hiding from my kids to sneak treats (especially ice cream). I love rainbows and naps, and I find any excuse to go to Target. When I actually make it out of the house in real clothes, I document my outfits on my fashion blog, Leather & Lip Gloss. My love for fashion also inspired me to start my own comprehensive style website, The Style Spectrum. 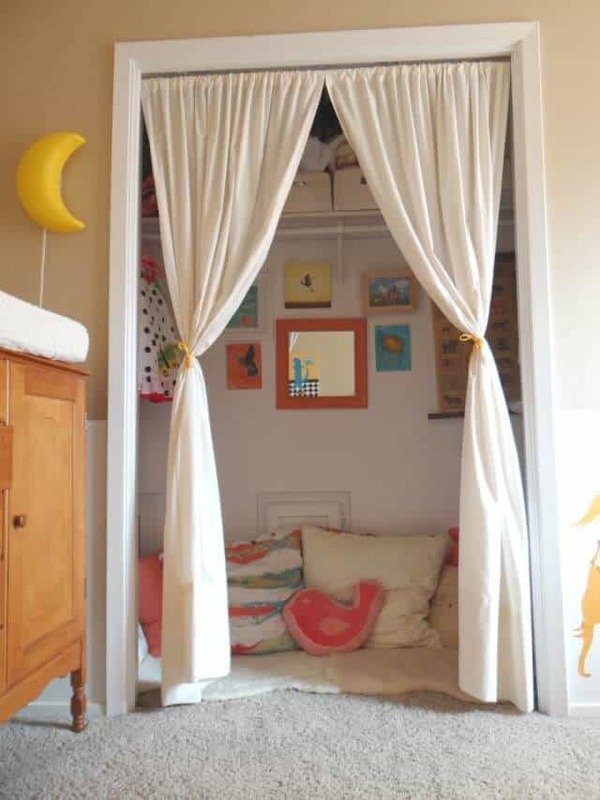 The post 7 Cozy Reading Nooks For Kids appeared first on Life As Mama.